Vacation Rentals - Holiday Rental ads in the city of Angers in France for Tourism. 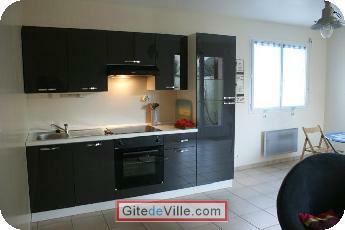 Self Catering Vacation Rental of 40 m² in Angers for 2 peoples. All on ground level, comprised of a living room / kitchenette (electric elements, microwave, refrigerator, eating area. The living room area has 2 armchairs, a coffee table and a television. A separate bedroom with two twin beds can be modified into a double bed. Washroom and WC are separate. Small, flowered terrace with garden furniture and barbecue. Baby cot and booster seat available. Linen included. Cleaning not included. Animals accepted. Only 15 minutes by foot from Angers’ town centre and 10 minutes by foot from the historical district. Last Ads update : 10/05/2018. Owner of an urban accomodation or B&B to rent in Angers ?